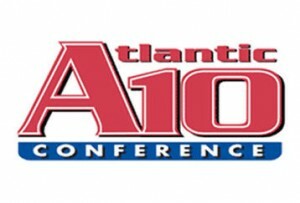 Fans at the A-10 Tournament evening session were treated to two hard-fought contests where the winning points were scored with less than five seconds remaining. Saint Joseph’s ended Xavier’s Atlantic 10 run, 58-57, in a game that came down to a full court inbounds pass with 1.4 seconds remaining that ricocheted off of Xavier’s backboard. Isaiah Philmore, trailing the play, found the ball in his hands, but despite a good angle could not convert the shot. He collapsed on the court as time expired. In the other game, Massachusetts ended George Washington’s season with a 77-72 decision that was settled at the free throw line with five seconds left on the clock. 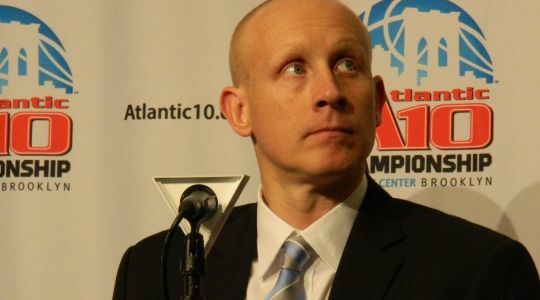 Chris Mack and his Xavier squad ended its A-10 season ended with a heartbreaking loss Thursday evening. Will Tucker is an RTC correspondent and a Big East microsite writer. 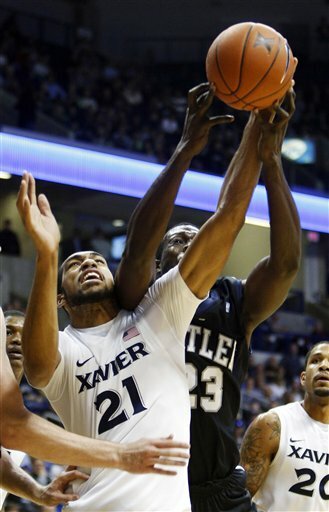 He filed this report from Xavier’s game versus Butler in Cincinnati today. Chris Mack’s Musketeers had won two years in a row and nine of the last 11 meetings with Butler but still entered today as a four-point underdog on its home court against a CBI team that lost starter Ronald Nored and projected starter Chrishawn Hopkins. But that wasn’t entirely unreasonable, considering Xavier’s roster was shrouded in uncertainty, completely overhauled from a season ago after its starters all either graduated or left town. Its most experienced returning player, Travis Taylor, entered his senior campaign having logged less than 15 minutes per game, 4.5 PPG and 3.7 RPG last season. So it’s hard to fault all but the most devout Musketeer faithful for writing Xavier off as a rebuilding project in 2012-13. An Early Season A-10 Masala: Does anyone want to be the regular season champion? The first week-plus of conference play suggests the title and #1 seed in the conference tournament is a hot potato that no one wants to handle. Temple continues to have the fewest losses overall, but the Juan Fernandez-less Owls were dumped rather hard in Pittsburgh over the weekend, dropping a 12-point decision to overlooked Duquesne. Richmond was poised to take over the conference lead, but dropped a four-point game to struggling Rhode Island, leaving the door open for Dayton, who then lost to Xavier by five. 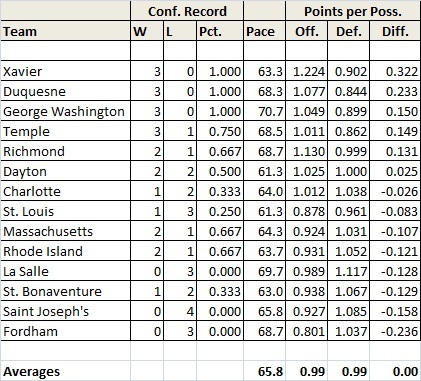 The Musketeers, Duquesne and George Washington are the only undefeated schools left in the conference race, but as the chart below suggests, the twists and turns through the first 20%-25% of the conference schedule hint that this conference race will be hotter and closer than anticipated. Xavier coach Chris Mack, struggling with a roster depleted by injuries and academics and scrambling for some answers on offense in the weeks before conference play has emerged as a very early favorite for conference coach of the year. Of course, if the Dukes maintain their momentum and Richmond puts it back together, the coach’s race may turn into a masala too. With upsets over the weekend, the conference standings are jumbled, and though my power rankings differ from the standings, I have moved even more teams around this week. The Musketeers had a 2-0 week as Tu Holloway received an Honorable Mention from the conference as he averaged 25.0 points and 7.0 assists in X’s wins over Massachusetts and Dayton. Mack’s squad will travel to St. Bonaventure for their game Wednesday, and return home for a crucial conference matchup with Temple on Saturday. The conference’s sole representative in Top 25 polls was dropped again, one of several consequences of their Saturday road loss to Duquesne. The Owls finish their “out of conference” portion of their City Series schedule when they host the Penn Quakers on Wednesday, and return to conference action with a crucial game at Xavier on Saturday. The Spiders squandered an excellent opportunity to replace Temple at the top of the A-10 Conference standings and the Top 25 polls as they lost their only game of the week, a four point, 74-78 decision to Rhode Island. Richmond will host Rhode Island Thursday and then take the weekend off. The Dukes ran their winning streak to eight with yet another 2-0 week. Senior Damian Saunders earned his second Honorable Mention from the conference as he averaged 10.5 points, 9.5 rebounds, 3.5 blocks and 2.5 steals over the Dukes’ two wins last week. In the preseason, this pair of games was expected to produce an 0-2 week. Duquesne has, however, caught the eye of stats guru Ken Pomeroy who counted the Pittsburgh-based school’s results so far as one of the surprises of the season. Last week’s wins, both in convincing fashion, will raise the school’s profile and fan expectations as the season progresses. Head coach Ron Everhart and company have a quick road trip to Philadelphia for an important two-game homestand coming up. They host an undermanned, Rick Majerus-less Saint Louis team Wednesday and an Owls squad that may not have junior point guard Juan Fernandez available on Saturday.. The Runnin’ Rams got an infusion of Orion Outerbridge and the re-instated forward powered them to a 2-0 week and earned himself a Player of the Week nod from the conference for his performance last week.. Another Wednesday road game (it worked last week) at the Hagan versus Saint Joseph’s, and then Rhode Island returns to Kingston to host La Salle. Both the Hawks and Explorers are struggling right now, the Rams can move higher in the standings and create some daylight for themselves. The Minutemen had a 1-1 week. After a painful 29-point loss at the hands of Xavier, Coach Kellogg’s squad bounced back with a three point win over La Salle. Massachusetts takes to the road for a game in Charlotte Wednesday, and then return home for an important test against Richmond on Saturday. The Colonials logged a 1-1 week, routing Fordham to go 3-0 in conference play, then dropping a five-point decision to Harvard out of the Ivy League. George Washington has worked through the softer part of their A-10 schedule (Saint Joseph’s, La Salle and Fordham), and their road game with Richmond should give fans an indication of where the team stands. The Colonials return to DC to host St. Bonaventure Saturday. The Flyers finished another 1-1 week. Senior forward Chris Wright earned an Honorable Mentio from the conference as he averaged a double-double (12.0 points and 10.0 rebounds) for the third straight week. Wright and freshman point guard Juwan Staten, who earned a Freshman of the Week citation himself for his 13.0 point per game average and 58% accuracy in the Flyers’ two games last week, have emerged as the principal offensive options for Dayton, drawing 27.9% and 24.1% of the possessions and taking 25.6% and 21.1% of the shots, respectively, when they are on the floor. Neither however has been particularly efficient with those possesions, posting offensive ratings in the mid 90’s (about 0.95 points per possesion). There are other, more efficient options (Chris Johnson? Paul Williams?) available. While neither Staten nor Wright have been shooting particularly well from the floor, both could boost their ratings (and help their team offensively) by hitting their free throws. Wright shoots about 60% from the line, while Staten converts about 56%. Wright’s ability to get to the line is an important offensive option, but with a below average conversion rate, he does not punish the opponent enough for the foul. Dayton plays a single game this week as they host Fordham on Saturday. A win would put them back above 0.500 in conference play, a place they need to be as the week following will be very tough (Richmond and Duquesne). Coach Mike Schmidt’s Bonnies stumbled through an 0-2 week, dropping their conference record to 1-2. Guard Michael Davenport led the Bonnies in scoring for both games, and recorded a career-high 28 points and 12 rebounds in the loss to Rhode Island. The Bonnies have another challenging week, as they host Xavier Wednesday and travel to Washington DC for a tilt with George Washington. St. Bonaventure has an advantage in the Xavier game as the Musketeers may be looking past them to their Temple game on Saturday. The George Washington holds conference seeding implications, as both SBU and GWU may be in need of a tie-breaker come March. Charlotte broke their losing run in conference play with a 10 win over Fordham. Senior Derrio Green was honorably mentioned by the conference for his season-high (second time) 21 points, 19 of which were scored in the second half, in the 49ers’ Fordham game. Coach Alan Major‘s squad will host Massachusetts on Wednesday and travel to Pittsburgh to play Duquesne on Saturday. While Charlotte is favored against the shot-challenged Minutmen, they will have to value the ball (something they have struggled with this season) against a team that typically ends 22% of their opponents’ possessions without a shot. The Charlotte front court is bigger than their Duke counterparts, but Temple struggled to gain an advantage in the lane and low post last weekend. The Billikens’ broke their fall with a win over Saint Joseph’s, but not before recording loss number six in their run. Freshman forward Dwayne Evans recorded a career-high 16 points and 18 rebounds — his first career double-double — in the Bills’ win over Saint Joseph’s. The confernce cited Evans for his performance. Recently re-admitted and re-instated Kwamain Mitchell is listed on the Billiken roster as “awaiting NCAA clearance”. No sign of Willie Reed. La Salle bounced back against Big 5 rival Penn to insure they would not suffer another winless week. Aaric Murray, as predicted by Explorers Coach Dr. John Giannini, did respond to the benching by averaging 15.0 points in La Salle’s two games. The sophomore center notched a 19 point, eight rebound game against Penn and followed with a 12 point, eight rebound performance in the Explorers’ three point loss to Massachusetts. The Explorers’ shot defense is the biggest (but not the only) problem so far. They have enough offense to prosper in the conference, but allowing opponents to convert 50.5% of the field goal attempts puts a large onus on their offense to keep up. Oddly, they defend the two-point field goal attempt only slightly better than the three-point field goal attempt. If Murray and company can step up their defensive intensity (and rebounding…) they may have a chance to drop Duquesne from the ranks of the conference undefeateds as the Dukes visit the Gola Wednesday. They travel to Rhode Island for a Saturday game. Neither will be easy. Three games into 2011 and Fordham continues to look for their first win of the new year. Their losing streak has stretched to five games with their just concluded 0-2 week on the road, and things are not looking up as the Rams host Saint Louis Wednesday and travel to Dayton for a Saturday game. The squad is plagued by the twin demons of poor offense and porous defense, a common problem for inexperienced squads. And coach Tom Pecora has a squad Ken Pomeroy ranks in the bottom 19% for experience (ranked #279 out of 345). Pecora has to break the cycle established during the previous two coaching regimes — the staff recruits promising players; the team loses; the recruits become discouraged; the recruits transfer out; repeat. Right now, Pomeroy gives the squad a 6.5% chance of finishing their conference slate winless. Though the Rams are not favored to win any of their remaining conference games by Ken Pomeroy, there are several home games which should give them better opportunities. There are none coming this week however. The first step may well be to be competitive in the games they do have. The Hawks’ slide numbers four consecutive games, all logged on their conference slate, with those two additional losses last week. The road loss by six to Dayton might be a sign of hope for Hawk fans, but the 16 point road loss to a Saint Louis squad with even less experience (per Ken Pomeroy — , Saint Joseph’s is ranked #329 while St. Louis is ranked #338) has to be a bucket of cold water, but the more immediate task (like Fordham) may be to hold onto a nucleus of promising players as the program weathers the storm, and build on them for next season. The game to catch this week will be on Saturday, when Temple visits Xavier. In less confusing times this was tabbed as an early season showdown for the top spot in the conference. When Xavier lost Jay Canty, Justin Martin and Brad Redford, Owl fans no doubt sensed blood in the water and an early knockout for Temple. Juan Fernandez’s injury however has exposed a shallow Temple rotation, and Temple’s loss to Duquesne over the weekend has made this a very, very important game for Temple. Lose in Cincinnati and the Owls risk falling two games off the pace. Wednesday will feature a matchup important to Richmond, who dropped a home game to a re-energized Rhode Island team last Thursday. The Spiders like Temple find themselves in a scramble at an unexpected point in the season. Bracketologist Joe Lunardi has the Spiders on the outside looking in right now. Taking a second loss at home and to George Washington would seriously damage their case for an at-large bid should they not win the conference tournament. 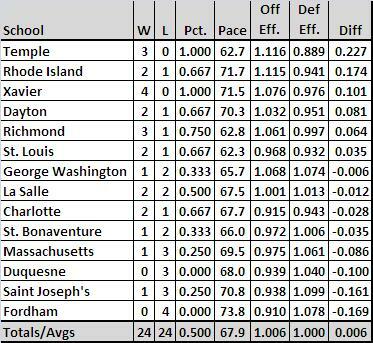 George Washington’s conference schedule so far has included Saint Joseph’s, La Salle and Fordham. Richmond is their first serious conference test. The start of fall Practice on October 15 shook out the statii on a few linger question marks in Saint Louis and Rhode Island, but the attrition that has followed the opening of practice, whether injury or other causes, seems heavier than usual in 2010. As the table below shows, bumps and bruises and one-game suspensions aside, 18 players (more than one per team) have missed practice and playing time due to injuries or academic issues since Midnight Madness. 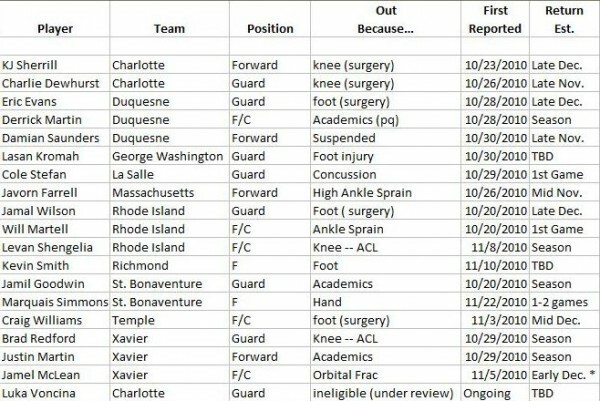 Five players will sit out the season, with others missing anywhere from several games to several months of the season. For some teams and players, it is a matter of not having what you did not have before (Xavier and Justin Martin, Rhode Island and Levan Shengelia…unless you believe one minute of playing time had an impact on the team), but for others — Lasan Kromah and George Washington, Brad Redford of Xavier for example — the impact could affect the season. Among the unresolved is Luka Voncina, Charlotte’s freshman point guard from Slovenia, whose eligibility ruling (ineligible) was appealed in late October. Throw out the preview, a fortnight into the season and the ink of mid-October is already obsolete. The Power Rankings will reshuffle several times over the next month as teams react to player comings and goings, and a gradually tougher schedule. Temple beat middle-of-the-conference team Seton Hall by six at home to open the season, and will have an opportunity to notch a few resume wins in Orlando as they take on California on Thanksgiving Day, to be followed by either Georgia or Notre Dame Friday 11/26. Depending on the results of the first two games, the Owls could face Wisconsin (most likely), Texas A&M or Boston College. Georgia and Wisconsin received votes in the most recent Coaches Poll. Devin Searcy was cited on the November 15 conference Honor Roll for his double-double (15 points, 12 rebounds) versus Mount St. Mary’s (a 70-52 Flyer win). Dayton travelled to Oxford, Mississippi, Saturday and beat the Rebels of Ole Miss, 78-71, for the second time in eight months. The two teams met in the NIT semi-finals last March, and coach Andy Kennedy’s squad has been projected as a top-two finisher in the SEC West Division this season. The win should look very good on the Flyers’ resume. The conference named Jawan Staten Rookie of the Week (the first of several citations he will receive this season) for his performance against Mississippi in particular. The freshman point guard dished seven dimes, matching his effort from his debut versus Akron. Staten also hit the layup that gave the Flyers their first lead (in the overtime period) of the game. Jamal McLean, expected to miss a month due to an orbital fracture suffered just before the start of the season, missed in fact only a single game. Is he 100%? Tu Holloway earned Conference Player of the Week honors in each of the first two weeks of the season, scoring 25 points in the Musketeers season opening win, 68-65, over Central Michigan, 28 points in Xaviers win over Iowa in the first round of the Paradise Jam and a scorching 35 points in Xs 57-52 win over Seton Hall, but the well went dry against Old Dominion, as Holloway and wing Dante Jackson went 6-21 from the field (28.6%) and 7-10 from the stripe for 22 points. The Monarchs managed to exploit two Xavier weaknesses that have emerged in the early games – rebounding, where ODU held a 36-25 advantage, and three point shooting. Xavier managed an offensive rebounding rate of just 10.7% while allowing ODU a more normal (for D-I) rate of 33%. Perhaps because they were down eight at the half, Xavier took 20 of 45 field goal attempts from beyond the arc, a whopping 44.4% of their field goal attempts overall, well above their typical 33.7% ratio. They converted only five of those threes, yielding a 25% conversion rate, below their 33.3% conversion rate coming into the game. The X-Men missed injured Brad Redford, a wing with a deep range. The Spiders’ first two wins were impressive displays of efficiency, as Richmond held both to less than 0.8 points per possession, outstanding among games in the opening week. The Iona loss was disappointing, but coach Tim Cluess developed a strong reputation as a game coach during his days in Division-II. Yet, it does not explain the sluggish performance in a win against Charleston Southern. The Spiders rounded back into form with an efficient 81-40 midday win over Southern, featuring a 66-possession game with Richmond holding Southern to 0.61 points per possession defensively, while scoring at a rate of 1.23 points per possession. The story of the first two weeks is Richmond’s defense. Massachusetts opened their season with a 77-67 win over Rider of the MAAC, during which senior Anthony Gurley logged his 1000th point as a Minute Man on his way to a game and career-high 31 points. The conference cited Gurley on for his scoring in the Minutemen wins over Sacred Heart and New Mexico State. Wins over the Aggies and Mountain West Conference member Texas Christian are a pleasant surprise and a stars on their resume. The Bonnies stumbled out of the gate, dropping a 80-70 decision to Canisius, but coach Mark Schmidt’s squad has followed with three wins, two on the road. Andrew Nicholson was cited in the November 15 conference Honor Roll for his 23 and 25-point efforts in the first two games. Best of all, Demitrius Conger was cited for his double-double versus Cornell. The sophomore wing logged career-highs in points scored (22) and rebounds (16) in the Cornell game. Good news for the Bonaventure faithful, as they will need an alternative on offense if Nicholson is to be effective this season. 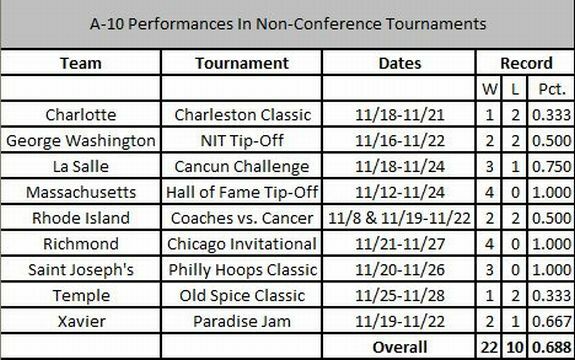 The conference Honor Roll cited Delroy James two weeks running for his season average (19.0 points and 6.0 rebounds per game) and performance at the Toledo Pod of the 2K Sports Classic Benefitting Coaches vs. Cancer. James scored 17 second half points in the Runnin’ Rams’ season-opening loss to Pittsburgh November 8. With both Xavier and Saint Louis struggling to overcome injuries, coach Jim Baron wanted to see URI move up. The loss to UIC could come back to sting the Rams come March. Even with Lasan Kromah out indefinitely with an left foot sprain, the Colonials went 1-1 (76-67 vs. Boston U; 79-59 vs. Marist) the NIT Tip-Off the North Pod, The Colonial host one of three consolation pods, and needed that home court advantage to knock off the Nevada Wolf Pack on Monday night. Tyreek Duren took the first week’s Rookie of the Week honors his work in La Salle’s 82-71 season-opening win against Columbia on November 12. The guard dished nine dimes in his collegiate debut, tying an 11-year-old program record set by Julian Blanks in his collegiate debut in 1999. Another performance that had to raise the hopes and warm the hearts of Explorer fans, was fifth-year senior Ruben Guillandeaux’s career-high 29 points. The senior, one of three La Salle seniors who finished the 2010 on the sidelines, was granted a redshirt waiver by the NCAA and will finish his career at La Salle as the mentor for a corps of promising freshmen guards. Aaric Murray is another Explorer performing admirably. When he notched nine blocks and five steals against Morgan State on November 20, he became the first D-I player to do so since Sitapha Savane of Navy back on January 31, 2000. Senior forward/guard Bill Clark drew a conference nod for his near-triple-double (a Duke player has only turned that trick once) with his 15 point, nine assist, eight rebound effort as Duquesne opened their season against D-II Bluefield State (WV) with a 110-67 rout of the Big Blues. The stumble against Robert Morris is a point of pride. The local rivalry goes back to 1981, and the Dukes hold a 15-5 advantage, last losing to Robert Morris in 2006. The school is investigating allegations that coach Ron Everhard had a student manager send 15 pairs of basketball shoes to the coach of Broward Community College as a gift to the Broward basketball program, strictly prohibited under NCAA regulations. Duquesne officials have described the equipment as a donation to a program operated by Broward CC coach Bob Starkman that supplies athletic equipment and accessories to troops stationed in Afghanistan and indicated they notified the NCAA of “the secondary violation” on November 19. Newcomer Jamar Brisco drew conference kudos for his 30-point debut against Gardner–Webb on 11/12. If the 49er faithful loved Brisco, their feelings about the game itself were far cooler, as Charlotte stumbled to a 2-3 record out of the gate. Losses to Gardiner-Webb, 78-70 (the one-game suspension of forwards Shamari Spears and An’Juan Wilderness did not help the 49er cause), in coach Alan Majors’ debut and the double-overtime loss 79-75, to Coastal Carolina in the Charleston Classic (the 49ers went 1-2 in that invitational) are particularly distressing given both teams are out of the Big South Conference. The 49ers may want to cut back on three point attempts until Darrio Green can find the range. Through their first five games the 49ers have taken 39.9% of their field goal attempts from beyond the arc, but have hit an abysmal 28.2%. When you are in a hole, stop digging. Charlotte limped out of Charleston with a 1-2 record on the event. The Billikens dropped a bunny against Austin Peay of the Ohio Valley Conference and fans started a Facebook paged titled: Free Willie & Kwamain Facebook page. That has to make a 2010 list for Most Ironic Website Name or Website Name in Poorest Taste somewhere. After exploring the transfer option for a month, an apologetic and contrite Willie Reed has indicated he would like to re-enroll at Saint Louis and play for the Billikens once the spring semester hits. The good news in those losses is that that the margin of victory was within a single possession. Freshman center Rob Low has started every game and averages 20.3 minutes and 14.0 points per contest. It is tough being young. The freshmen collectively contributed 95 points on 31-98 (31.6%) shooting, to go with 59 rebounds in the Hawks’ three games. Each of them have averaged just under 20 minutes per game, ranging from 27.3 minutes and 10.7 points per game (Langston Galloway) down to 13.0 minutes and 2.7 points per game (Patrick Swilling). If minutes and points vary widely, efficiency sadly does not, as their eFG%s ranges from a relatively inefficient 42.5% (CJ Aiken) down to a very inefficient 33.3% (Ronald Roberts and Swilling). The freshmen, however, are not alone in their shooting woes, as the entire squad suffers from an inability to convert shots (and possessions) into points. Typical of younger teams, they also need to rebound better. Though Chris Gaston was cited on the November 15 conference Honor Roll for his 20th career double-double (21 points, 17 rebounds) in the Rams season opening loss, 63-59, to Brown on 11/12 Fordham continues to struggle. More competitive than the 2010 squad, coach Tom Pecora still needs to solve Fordham’s lack of offensive production. Gaston combines with junior guard Alberto Estwick and freshman guard Branden Frazier to form the nucleus of Fordham’s offense. So far however, only Estwick’s 42.9% field goal conversion rate (52.8% eFG%) is efficient enough to move the offense. When Frazier finds his groove perhaps he and Estwick can draw enough defensive attention to free up Gaston, who at this point, is mostly a volume scorer.